Mix together some corn syrup, plenty of sugar, a little flavour like peppermint oil, and the juice of the sapodilla-tree. Roll the doughy mixture out into thin sheets, cut them up into sticks or pellets, wrap each one up in bright paper. Every American chews on average 300 pieces a year, every Briton 100, every Japanese 200. Indians in Central America discovered at least a 1,000 years ago that ‘chicle’ was good to chew. It oozed out of cuts in the wild sapodilla-tree, thick and milky, in much the same way as rubber trickles out of rubber-trees. Although many other variants have been experimented with, ‘Chicle’ is the basis of chewing gum as we know it today, and was invented in the 19th century by American Thomas Adams. In 1869, Mexican General Antonio Lopez de Santa Anna told his idea of chicle to Thomas Adams. Initially though Adams tried to use chicle to make rubber. He tried to make toys, masks, and rain boots out of chicle, but neither of his products were commercially successful. In 1869 he simply added flavor to the chicle! That was the first step for creating world’s first modern chewing gum! The first mass marketed chewing gum was called “Adams New York Chewing Gum”. In the 1870s, Adams & Sons sold “Sour Orange” flavored gum as an after dinner candy. In 1871 Adams patented a machine for the manufacture of gum. That same year Adams also created a licorice-flavored gum called Black Jack. However, all the these gums had one big problem, they could not hold their flavour. The problem with holding flavour was not fixed until 1880, when William White combined sugar and corn syrup with chicle. For a better taste he added peppermint extract and discovered, that peppermint stayed in the gum during chewing for much longer than other flavors. He called his first peppermint flavored gum “Yucatan gum”. 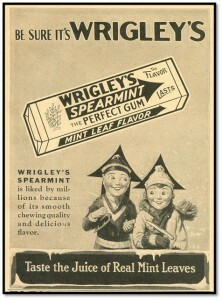 In 1891 William Wrigley Jr founded Wrigley Chewing Gum. Existing companies offered similar products that were much more popular, than gums from Wrigley’s. However as a sales gimmick he gave away packets of chewing-gum with every order of baking-powder he received from grocers. When he noticed that the chewing-gum was more popular than the baking-powder, he decided to make and sell chewing-gum himself. 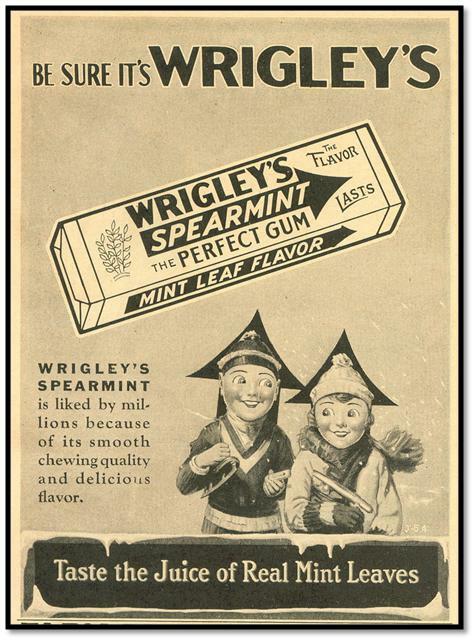 Wrigley ended up with factories in the United States, Germany, Australia and Britain making Spearmint, Juicy Fruit and PK, for the whole world to chew.